Today is the first cut of the sod for NEW AARCH, the new school of architecture in Aarhus, Denmark. Just a few days after the announcement, the winning team is meeting up with local students to discuss ideas for the new school. On Friday 17 March the winners of NEW AARCH, the first ever new school of architecture in Denmark, were announced. Today, just three days later, the work begins. The winning team is a collaboration between Vargo Nielsen Palle, three newly qualified architects and the Danish architectural office, ADEPT. NEW AARCH is a ‘school for architects by architects’ and therefore it is very important to Martin Krogh, founding partner and architect at ADEPT, to include the architecture students in the design process. ‘This Monday we are holding workshops with some of the students at the current school to figure out how NEW AARCH should be designed for use. Hopefully they will have ideas for the facade and the general use of the building that we haven’t thought of ourselves,’ he says. Besides brainstorming and generating ideas, one of the items on the workshop’s agenda is to build a 1:50 scale model of the school. The timetable for this architectural project is ambitious. The new school is planned to be finished and ready to welcome new students in approximately three years from now – meaning 2020. But the tight schedule does not frighten Martin Krogh. ‘This project works hard from the beginning. It’s an ambitious timeline, which requires a lot of effort from everybody, but I believe it’s good to take quick action and not drag the process out for too long,’ he says. Aarhus School of Architecture wanted a flexible framework around workshops, architectural experiments and interactions. The winning proposal is designed as a living laboratory and has a distinctive character, suitable for everyday life. 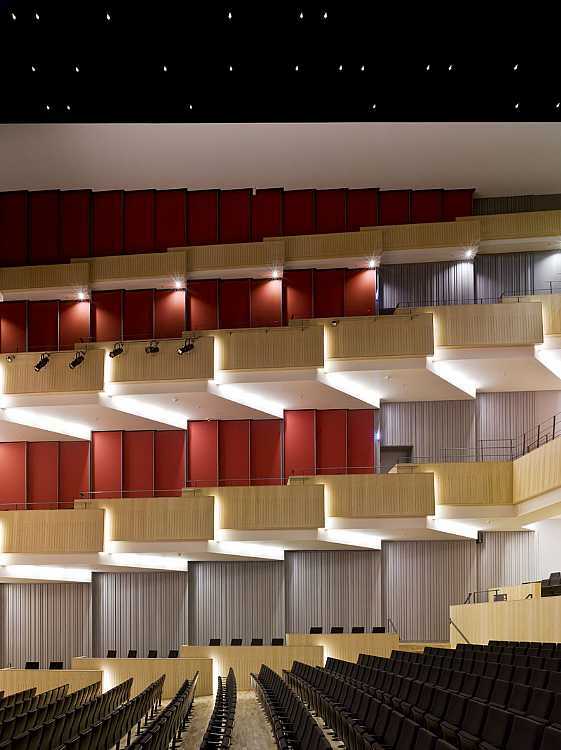 One of the characteristics of NEW AARCH is openness, which has also been a recurring theme in the collaboration between Vargo Nielsen Palle and ADEPT. 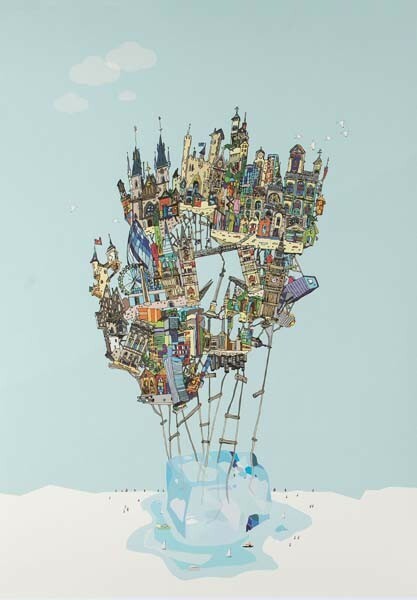 ‘A collaboration like this demands respect for each other and openness towards ideas. Openness is the key when you work in a cross-functional forum. 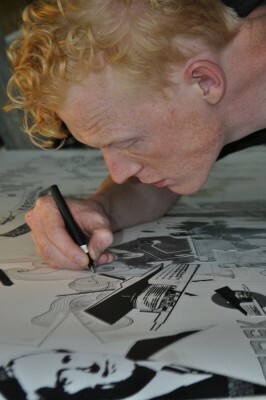 We have welcomed Vargo Nielsen Palle into our studio to develop the project together and we have had fun collaborating. Some of their ideas live with ours and vice versa. In this way, we create our strongest ideas and that’s what we hope will happen when we invite the students to work with us,’ Martin Krogh concludes. 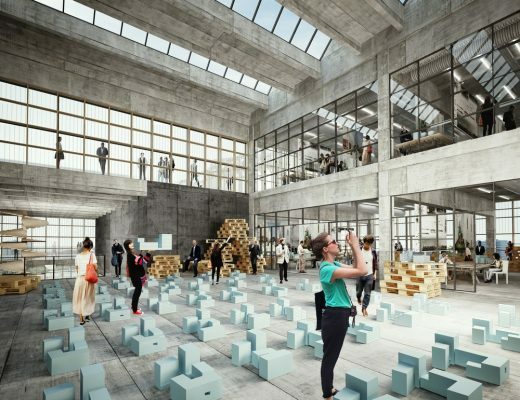 Besides the architectural school, the 13,000m2 NEW AARCH will also include an architectural workshop for children, guest houses and smaller workshops for ‘Institut for X’. The newly established architecture practice Vargo Nielsen Palle, led by three recently qualified architects, has won the restricted design competition NEW AARCH ahead of established and internationally recognised practices. This was the result of close interdisciplinary cooperation with ADEPT, Rolvung & Brøndsted Arkitekter, Tri-Consult and Steensen Varming. On the 17th of March a unanimous jury announced the winner of the restricted design competition NEW AARCH. The newly established practice Vargo Nielsen Palle, led by three recently qualified architects, has won the restricted design competition NEW AARCH ahead of established and internationally recognised practices. 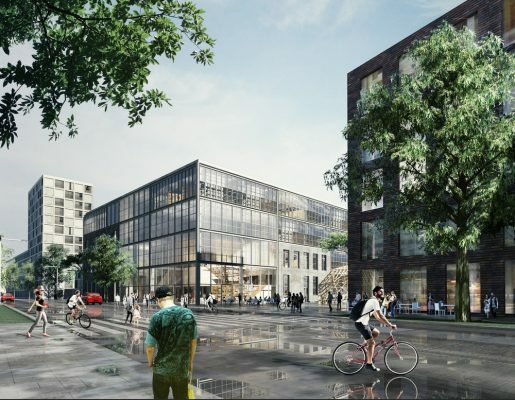 This was announced 17th March at an event at Aarhus School of Architecture in which participated, among others, the Danish Minister for Transport, Building, and Housing Ole Birk Olesen and Mayor of Aarhus Municipality Jakob Bundsgaard. “It is a powerful project that interweaves with its surroundings, Ådalen, the city and the surrounding neighbours in the area. The new school of architecture will be a cultural hub that encourages interaction and dialogue. An open, pragmatic, flexible structure that allows for continuous change and adaptation to changing needs, and which focuses on the future life and activities inside the building. It will be a factory for architectural experimentation that will set the stage for cooperation with the city, the profession and our neighbours – just as we wanted”, said the happy rector of Aarhus School of Architecture, Torben Nielsen, who is looking forward to leaving the out-dated premises in the old merchant’s house at Nørreport – premises which have been the ‘temporary’ home of Aarhus School of Architecture for more than 50 years. The Jury could have chosen up to three projects for further processing in a negotiation process, before making the final decision. However, a unanimous jury found Vargo Nielsen Palle’s project so compelling that they chose to invite only this team to the negotiations. The project was drawn up in cooperation with ADEPT, Rolvung & Brøndsted Arkitekter, Tri-Consult and Steensen Varming. In terms of scale, the winning project relates well to Carl Blochs Gade and plans the many uses as a ‘city within the city,’ where visual contact between the school’s diversified users encourages cooperation and mutual inspiration. The building structure is stepped down in height towards a central urban space that opens up the school towards the city and the neighbouring institutions. A total of six companies participated in the restricted design competition. Three teams had been pre-qualified based on their experience, while another three were selected through an open design competition, in which 230 participants from around the world submitted proposals for a new school. The two-stage competition was precisely intended to give young, untested talents an opportunity to contribute. “Today the majority of design competitions are exclusively based on prequalification, which means that only established companies that have participated in numerous building projects qualify. The competition form that was chosen for this project challenged this, and the result shows that it was entirely successful”, said Norwegian Architect Reiulf Ramstad, who together with Architect Jens Thomas Arnfred, acted as design professional in both the open design competition and the restricted design competition. The Danish Building & Property Agency expects to enter into a contract with the consulting team behind the project immediately after the winning project has been announced. Subsequently, the project will be processed and detailed further through dialogues with the students and staff of the school before the project is expected to be offered as a design-and-build contract in the autumn. The winning consulting team will, together with the chosen design-and-build contractor, be responsible for the detailed design and for bringing the project home. The new school of architecture is expected to be ready for inauguration in 2020. It will cover approx. 13,000 m2 and have a total budget of DKK 261 million. •	Vargo Nielsen Palle and ADEPT (Denmark) in cooperation with Rolvung & Brøndsted Arkitekter, Tri-consult and Steensen Varming. •	ALL (Atelier Lorentzen Langkilde, Denmark) in cooperation with Buro Happold. •	BIG (Denmark) in cooperation with Transform, Rambøll, SLA and Tom Nielsen. •	EGA (Erik Giudice Architecture, Sweden/France) in cooperation with Niras and Kragh & Berglund. •	Lacaton & Vassal and BESSARDs’ Studio (France) in cooperation with Kristine Jensens Tegnestue, Jørgen Nielsen, Strunge Jensen and Sergio Fox Awe. 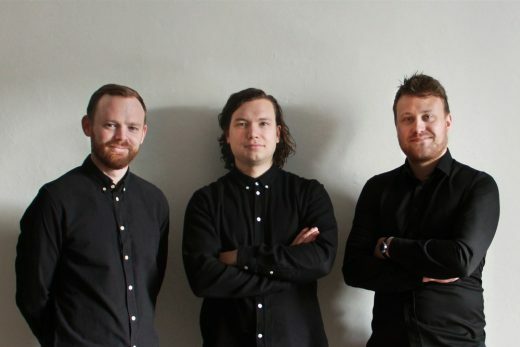 Vargo Nielsen Palle is: Brian Vargo, Jonas Snedevind Nielsen and Mathias Palle, who, after having won the Open Design Competition in the spring of 2016, set up their own practice, which is currently located at the premises of ADEPT in Copenhagen. The Danish Building & Property Agency is the client and developer. 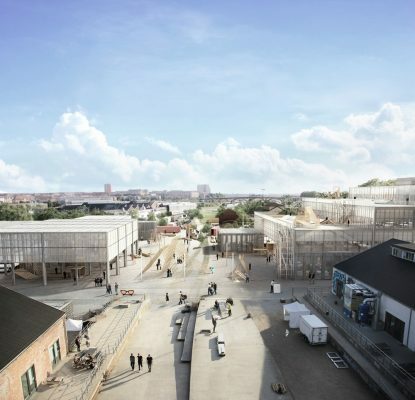 Aarhus School of Architecture is the tenant and end user of the planned building project. Realdania has contributed DKK 3.3 million to the Open Design Competition and the restricted design competition. •	Design professionals, Architects Jens Thomas Arnfred and Reiulf Ramstad (Norway) and Engineer Frank Jensen. 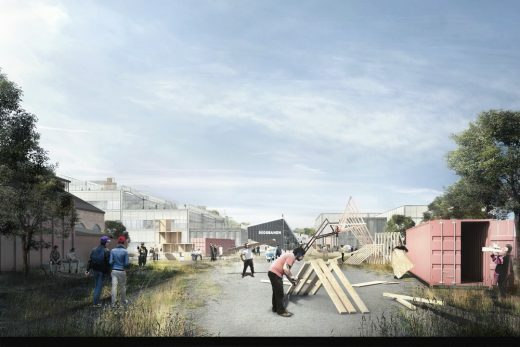 The advisers to The Jury included the following representatives of Aarhus Municipality: Director of Technical and Environmental Services Erik Jespersen and City Architect Stephen Willacy. Photos and illustrations of the winning project accredited to Vargo Nielsen Palle and ADEPT. Vargo Nielsen Palle is Brian Vargo, Jonas Snedevind Nielsen, and Mathias Palle. After winning the open idea competition for the school in 2016, they established their own architectural firm. They focus on an integrated design process, balancing financial, techni- cal, and architectural ideas into one design concept. Vargo Nielsen Palle will continue to lead the project from the invited competition in the same spirit. ADEPT was founded in 2006 by Anders Lonka, Martin Laursen and Martin Krogh that are in charge of ADEPTs creative works. 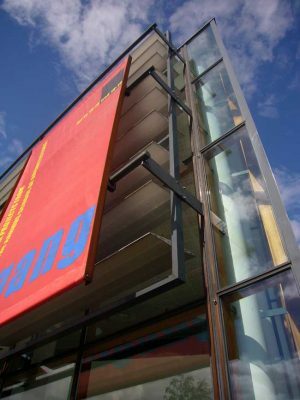 Within recent years ADEPT have completed a large number of cultural and educational projects, among these the award-winning ’Dalarna Medie Bibliotek’ in Falun, Sweden, UCN in Aalborg, National Museum in Frederiksberg and Ku.Be house of culture and movement, Frederiksberg. Rolvung & Brøndsted Arkitekter is a newly started firm with a special focus on architecture, project development, and project ma- nagement. They have projects in Denmark, Norway, and Greenland. Tri-Consult A/S is an engineering company based in Aarhus with 30 employees and advisors in a variety of specialties for projects throughout Denmark. Tri-Consult was founded in 1965 and has through the years built up a high degree of competency and experi- ence in new buildings, renovations, climate and energy, and civil works. Steensen Varming is a global engineering firm with expertise in mechanical and electrical engineering, lighting and sustainable design. The firm was founded in Copenhagen 1933 and has been involved in iconic international buildings such as the Sydney Opera House. They continue that legacy from offices in Copenhagen, London, Sydney, Hong Kong, and New York.